Panasonic announced the Toughbook CF-C1mk2, a new convertible tablet with Intel's Core i5-2520M (2.5GHz) processor. Panasonic today unveiled a series of upgrades to the mk2 version of the Toughbook CF-C1, the business rugged and lightweight notebook that can be used in clamshell or tablet form. The device, which is ideal for mobile workers such as field healthcare workers, sales forces and market researchers, has been upgraded with more processing power, memory and a faster wireless module. The Toughbook CF-C1mk2 uses the latest generation Intel® Core i5-2520M (2.5GHz) for increased performance and the Intel® HD 3000 graphics for enhanced multimedia capabilities. RAM memory has also been raised to 4 gigabyte with a 320 gigabyte hard disk drive as standard configuration. To help users make the most of their device, the CF-C1mk2 also includes Panasonic’s Quick Boot Manager which can improve the boot-up time of the device to approximately 15 seconds*. To improve data transfer capability, the new generation Toughbook CF-C1 uses the Ericsson F5521gw HSPA+ module with wireless ready connection manager, significantly increasing download speeds to 21Mbps. A 1.3 megapixel upgraded front web camera has also been added as an option for users needing to capture data or attend web conferences when away from the office. The Panasonic Toughbook CF-C1’s touch screen works comfortable in clamshell as well as in tablet mode, as its toughened triple hinge system keeps the screen rigid while the user is typing. The CF-C1 also offers up to 12 hours battery life (MobileMark™ 2007, 60cd/m²) with its twin hot swappable-batteries. With a single 4 cell battery installed, the unit is extremely light at just 1.49kg (and only 1.69kg with both batteries installed), and the moulded hand-free ergonomic strap lets users hold it easily in one hand while typing with the other. This makes the CF-C1 ideal for people who need to capture information in an environment where it may be difficult to put the unit down to type. Examples include field workers at the point of sales, researchers conducting customer surveys or nurses writing reports at a patient’s bedside. The convertible Toughbook CF-C1 features the option for a Multi-touch resistive touch screen that can be used with gloves, so it is ideally suited to healthcare workers such as nurses and doctors on visits to patients’ homes. The unit also includes a rubberised, disinfectable hand-free ergonomic strap. The device has a spill-resistant keyboard and is drop-tested in operation mode from a height of up to 76cm. The CF-C1 also includes the new Dashboard for Panasonic PC designed to simply and conveniently customize each Toughbook to the user’s preferred settings, providing a user friendly quick launch interface. The Dashboard also allows easy management of the device using helpful tools, such as the popular Panasonic Power Plan extension Utility and PC information Viewer utility. 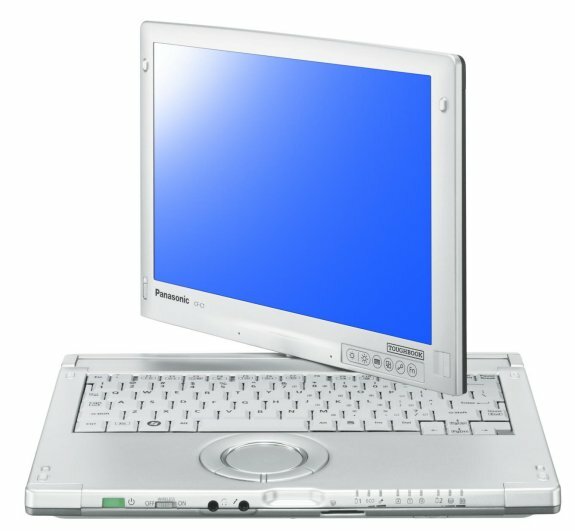 The Panasonic Toughbook CF-C1mk2 will be available from July 2011. Retail price starting at 1,899 euros plus vat.